As such, one of the primary subjects for the symposium concerned someone who seemingly takes pride in his promotion of fake news: President Donald Trump. Jeff Portnoy, a prominent Honolulu attorney and UH regent, lamented the diminished role of the traditional press in today’s political climate. “There is a national-level attack on the media… journalists are not respected anymore,” Portnoy said. Moments later, Portnoy singled out Honolulu Civil Beat, an online outfit, for producing “well-respected reporting.” One of Civil Beat’s top reporters, Chad Blair, was in the room. 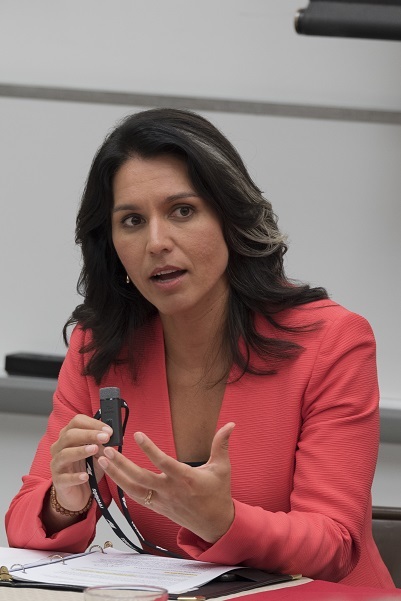 Blair was in town to moderate a panel featuring state Sen. Russell Ruderman (D-Puna) and state Rep. Chris Todd (D-Hilo), which included a Q&A session on some of the Legislature’s most controversial decisions. Aside from politics, other topics of interest were covered in-depth at the symposium, including the entertainment industry. 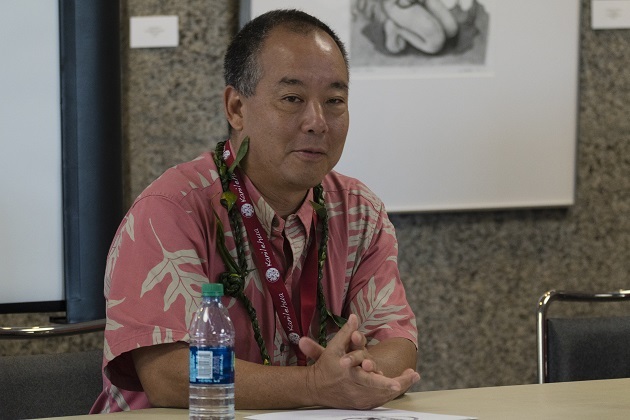 HPR’s Bracken questioned a panel featuring top experts in the Hawai‘i film, radio, and television industry. Denyse Woo, a radio personality at KBIG-fm, joined filmmaker Darrell Gabonia, director/producer G.B. 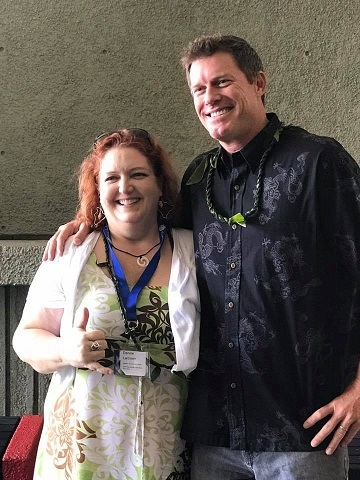 Hajim, and former Big Island film commissioner John Mason to discuss a “survival guide” for aspiring writers and directors in Hawai‘i. Hajim, whose film credits include a sci-fi movie starring Tim Curry and George Takei, made it clear to young artists in Hawai‘i: “You need to do everything, I’ve done everything… that’s how you survive on this island.” By everything, Hajim refers to acting, writing, directing, lighting, sound, set building, and any other aspect of putting together a project. Filmmaker Gabonia concurred. “In L.A., most people only specialize in one particular thing they do, that they can do better than anyone else,” like actors or costume designers. By learning technical crafts like sound work in addition to the more artistic craft of storytelling, Gabonia said, he was highly valued by others when attending film school in California. Around noon, the sessions in Campus Center were ready to break for lunch, which was held in Campus Center Plaza. While attendees sat and enjoyed their meals, a one-act play – titled “The Last Journalist” – was being read for the audience’s entertainment. Written by a student, Zoe Whitney, “The Last Journalist” takes place in a dystopian world where President Trump’s crackdown on the press, and disastrous saber-rattling on the Korean Peninsula, create a world where journalism dies an agonizing death. The actors, Ray Ryan and Asia Helfrich, read aloud from the script. After the play reading, the crowd welcomed a newcomer to the symposium: anchor Keahi Tucker of Hawaii News Now. 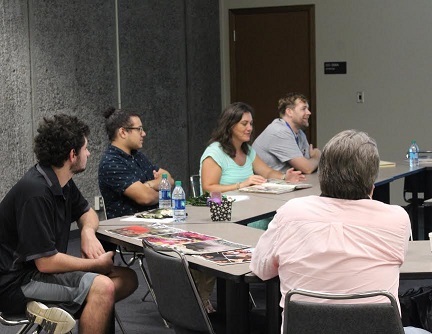 Tucker, who was in town covering the Merrie Monarch Festival, held court with the audience for over 40 minutes and fielded questions from students and fellow journalists alike. Tucker also expanded on his own background, with details on his upbringing in Kaua‘i, as well as his early days in the newsroom, traveling to Kansas, Baltimore, and back to Hawai‘i in the mid-2000s. When asked if he had any words of advice to young people like him, eager to make a name for themselves in journalism or media, Tucker urged them to never give up. “Forge ahead… find a good story,” and be passionate for what you do.